Find Out How To Reduce The SIDS Risk In Your Baby Nursery By Using These SIDS Prevention Tips. Please take the time to give this SIDS page your full attention. SIDS is NOT just something that happens to other people, and to a large extent it is preventable. Informing yourself about recognized safe sleeping practices, can go a long way towards ensuring infant safety and preventing a tragedy. A change to practices that promote safe sleep is the number one contributor towards SIDS prevention. Follow these infant safety guidelines to prevent SIDS from occurring in your baby nursery. In 1994, the U.S. Public Health Service organized a national "Back to Sleep" campaign, resulting in a reduction in SIDS deaths. In the past few years, the SIDS rate has dropped around 30 to 40 percent in the United States. Back sleeping, therefore, clearly contributes towards SIDS prevention. Have a lower chance of getting overheated. Are less likely to suffocate. What about babies who want to sleep on their tummies? Click here for advice. 2. If possible, breastfeed your baby. Breastfed babies have an up to three times lower SIDS rate. Breastfeeding, therefore, is an important factor in SIDS prevention. 3. Do not smoke during pregnancy, and keep your baby's environment smoke-free. Studies show that exposure to cigarette smoking at least doubles the risk of SIDS. SIDS risk increases proportionally to the number of cigarettes the mother smokes. Heavy maternal smoking (more than twenty cigarettes a day) increases your baby's SIDS risk fivefold. 4. Don't let your baby get too warm. Over bundling, and consequently overheating, has been shown to increase SIDS risk. Overheating may disrupt the normal neurological control of sleep and breathing. The respiratory control center in the brain is affected by abnormal changes in temperature, and SIDS researchers believe that overheating may cause respiratory control centers in some babies to fail. Uncover baby's head. The head and face are an infant's main source of heat release. Put baby to sleep on the back. Sleeping on the back releases the most heat. Don't bundle up a sick baby. Sick babies are likely to have a fever and when you cover a hot body, it becomes hotter. 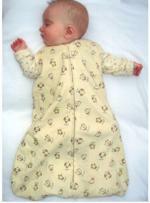 Dress baby for safe and comfortable sleeping. In general, it is safer to adjust baby's sleeping temperature by changing clothes than by piling on more blankets. Don't overheat the baby nursery or the room where baby sleeps. As a general guide, a sleeping environment temperature of around 68 degrees Fahrenheit (20 degrees Celsius) is preferable. Best humidity is around 60 to 70 percent. Less humidity may dry out a baby's breathing passages, making his nose stuffy and thickening the mucous in his airways. High humidity, on the other hand, favors the growth of respiratory allergens. 5. Make sure that your baby cannot suffocate. SIDS researchers now believe that many SIDS deaths are attributable to suffocation rather than a defective physiological or neurological response from the baby. Suffocation results from the baby breathing and re-breathing the same air until the oxygen in the air is depleted. Ensuring that baby has a constant supply of fresh air is a major factor in SIDS prevention. Keeping a flow of fresh air, is achieved by ensuring that baby's nose and mouth, are not obstructed by crib bedding or objects such as soft toys. Place baby's feet at the foot of the baby crib so that he or she can't wriggle under the covers. Covers should come no higher than baby's chest. Use a thin blanket. Soft crib bedding can suffocate infants. 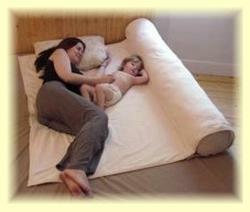 Tuck the blanket in well on both sides of the crib under the baby crib mattress. Remove quilts, soft toys, pillows, comforters and other bedding from the baby crib. Consider use of an infant sleep sack instead of a blanket - preferably organic. Use a clean, firm, snug fitting crib mattress and a fitted crib sheet - preferably organic. Chemicals released by synthetic fabrics used in baby crib bedding and mattresses are among the possible causes of SIDS. 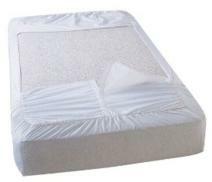 Read more about the infant safety benefits of an organic baby crib mattress here. Crib bumpers are not recommended. If you do use one, it must be flat and firm, not pillowy. It should fit around the entire baby crib and tie or snap into place. Cords should be less than 9 inches long. At a minimum the crib bumper should tie to the crib at the top and bottom of each corner and the middle of each long side. Do not place your baby on a waterbed, sofa, soft mattress, pillow or other soft surface to sleep. Read more about baby bedding and crib bumper safety here. Read more about crib mattress safety here. 6. Make sure that there is a good flow of fresh air. Have a source of fresh air that can enter the baby nursery - open a window, or keep the door partially open. Make sure window treatments don't obstruct the inflow of air. Always leave shades or blinds up a bit to let air in. 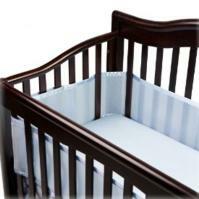 If crib bumpers are used, make sure there is space between the crib bumper and the crib mattress for the flow of air. A breathable mesh crib bumper is a good idea as it prevents baby's arms and legs from straying outside the crib and allows a good airflow at the same time. Keep infants at least two feet above the floor. Heavy gases can concentrate in the bottom of a room. 7. Other SIDS prevention measures. Use a baby crib that meets current baby crib safety standards - preferably organic. The chemicals out-gassed by wood veneers and finishes are also considered among the possible causes of SIDS. Make use of an Apnea Monitor.. Ensure that others caring for your baby (child care provider, relative, friend, babysitter) are aware of these SIDS prevention measures. It is recommended that your baby sleep in your room for the first year. For unknown reasons, the close proximity of a baby to its parents during sleep has been shown to reduce SIDS risk. Bear in mind, however, that cosleeping must be done safely to reduce the risk of suffocation. Click here for other safe cosleeping options. Click here for infant safety guidelines for co-sleeping. Consider offering a pacifier at naptime and bedtime: The pacifier should be used when placing your infant down for sleep and should NOT be reinserted once the infant is asleep. Research now indicates an association between pacifier use and reduced SIDS risk. What If Your Baby Protests Any Position Except Tummy-sleeping? Please be aware that SIDS researchers now recommend placing baby to sleep on the back - NOT the back OR side, as was previously the case. However, side-sleeping is still considered safer than tummy-sleeping for SIDS prevention. 1.Lay your baby down to sleep on the back from Day One to promote the habit of back-sleeping. 2.Let your baby fall asleep on her stomach first; then after she is soundly asleep gently turn her over onto her back. 3.Rock or nurse your baby off to sleep in your arms, or while wearing him in a baby sling. As soon as he is about to drift off to sleep, place him on his back. If he still refuses to fall asleep in this position, hang a mobile over the crib. (Out of baby's reach and moving at around 60 rotations per minute). This may help him to fall asleep more easily. If, after trying the above suggestions, your baby refuses to sleep on her back, (like my nine-month old) the best you can do is to provide a safe sleeping environment for your front sleeper. Use a firm sleeping surface and survey baby's sleeping environment for potential nose-blockers. Use crib sheets with velcro straps for safety. Remove cushy crib toys and pillows. Be sure crib bumpers, if used, are secured tightly and there are no crevices between the crib mattress and crib sides or bumpers. See my top ten safe sleep products guide. Two of my four babies have been tummy-sleepers. They were brought up from Day 1 to sleep on their backs the same as my two back-sleepers. But, just as with adults, some babies are tummy-sleepers, and there is nothing you can do to change it. My son, David, wanted to sleep on his tummy from the moment he was born. He just would not settle on his back. My husband and I knew little about SIDS prevention at that time so we put David to sleep on his tummy to keep him happy. My youngest daughter, Sarah, was not too crazy about back-sleeping as a newborn either, but after what happened to David, (click here to read my story), we refused to put her on her tummy. Sure she fussed a little, but after a while she would nod off to sleep. Now that she is older, rolling about and almost crawling, there is nothing I can do to prevent her from tummy-sleeping. I still put her down to sleep on her back, but she immediately rolls over. Needless to say, this freaks me out a bit. But, I have done everything I can to remove all other possible contributing factors towards SIDS risk. Her once beautifully made up baby crib, now consists of a crib, mattress and fitted sheet - that's it. She sleeps in a sleeper. If it's a bit cold I put her in a short-sleeved sleeping bag - no blankets. And I monitor her breathing with an apnea monitor. The fact that she tummy-sleeps is very unlikely to result in SIDS or suffocation in such a safe sleeping environment. SIDS usually results from a combination of factors. In David's case, he was on his tummy, he was too warm, and the blankets had slipped over his head. So don't panic if your baby wants to tummy-sleep. Just remove all other possible contributors to SIDS risk, and monitor your baby closely. Don't be in too much of a hurry for your baby to sleep through the night either. I know that is easier said than done. Like most moms, I have spent many a bleary-eyed mid-night hour staring at the wall, wondering when this helpless little package is going to stop interrupting my sleep. But, the fact is, that babies that are trained to sleep through the night, before they are physically ready, are at a higher SIDS risk. Use a Bedside Crib instead. That way, you get your sleep, and baby is kept safe. The longer babies sleep without interruption, the deeper the state of sleep they enter into. Some babies seem unable to awaken from this deep state of sleep due to immature development. This results in another SIDS death. Organic crib mattresses and bedding are a little expensive especially if you are switching from synthetic products that you already own. But, if this is an issue for you, please stop and look at the big picture. There is no price too high if it safeguards the fragile life of your precious son or daughter. I would give everything I own to have David here with me today. In the case of a tummy-sleeper, I would strongly advise the use of an organic crib mattress, as well as, organic crib bedding. A tummy-sleeper breathes air directly from the crib mattress, and is therefore, that much more likely to be affected by the chemicals in synthetic crib mattresses and bedding. ...Sit back, relax, and enjoy every precious moment with your new baby. The above SIDS prevention information is presented by Creative Baby Nursery Rooms for the purpose of educating new moms on the possible causes of Sudden Infant Death Syndrome (SIDS). Unfortunately, absolute SIDS prevention may never be possible. We believe that the information provided on this site can help with SIDS prevention, based on the results of ongoing scientific research but we make no guarantees in this regard.